Here’s an Asian method called Bokashi. This composting system needs temps above 60ºF to work well but is a great solution, even for apartment dwellers because there is little to no smell. 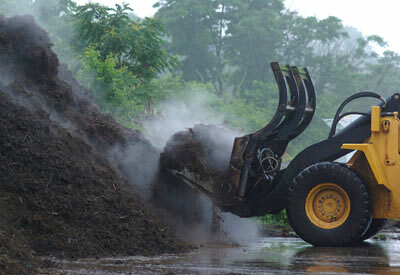 In aerobic composting, oxygen is used to accelerate the decay of organic material into compost. When free of contaminants, it is an excellent soil fertilizer as it increases its humus content. The process involves collection of feedstock, grinding of large woody material into smaller chips, and processing on concrete pads that trap any water runoff. Microbes break down the organic material. They thrive in an environment of 55% moisture, a 30:1 carbon to nitrogen ratio and with good airflow. The incoming feedstock is blended to create the ideal C to N ratio. The compost piles are monitored for temperature, moisture, oxygen and porosity to maintain optimum conditions. The compost will cook at 140-170°F for a pathogen reduction phase during which it is turned to aerate and ensure even heating. This is known as the pathogen reduction phase. It helps kill weed seeds and destroys fertilizers found in lawn grass. After this phase the compost goes through aeration and curing phases. The final product is screened before being ready for market. Aerobic composting can be done in either an open or closed system. 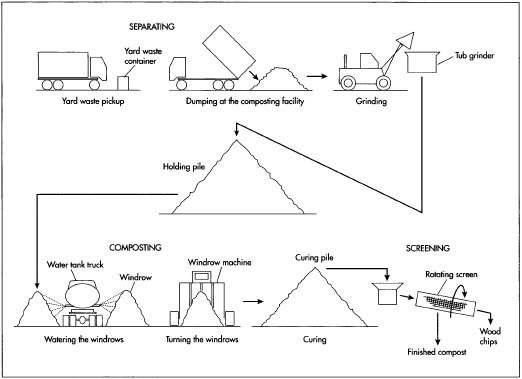 Closed or in-vessel composting is done in a closed environment. This can be a rotary drum or a large stainless steel lined container. The advantages of in-vessel composting are tighter control of temperature, odors, rodent control and the ability to compost meat and dairy products. Typically closed composters create compost quicker than open static piles. Here’s a short video from the Cedar Grove Composting website. This is where your yard and food waste goes to for conversion into compost.